I have a Nording pipe that has been causing me some headaches recently. Sorry if I use improper terms to explain the parts of the pipe but I'll do my best. Hopefully someone can help me out as long as I get the pictures posted right. It seems that when the draft hole was drilled, it wasn't exactly in line with the mortise. The pipe does not pass a cleaner while assembled. I've seen this to an extent on a few of my other pipes but not to this extreme. I can even pass a cleaner through this hole into the bottom of the mortise while the stem is in place. The problem I have with it is that when I draw on the pipe I'm actually drawing as much or more air through this hole than through the bowl. 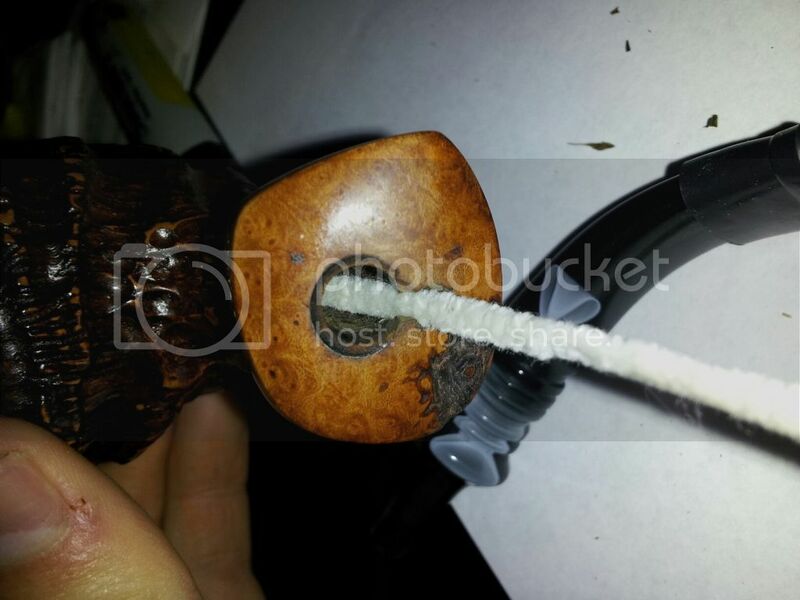 I find that when I plug the hole with a pipe cleaner/ my finger the pipe smokes perfectly. My question is what could I use to plug the hole with? I was thinking some kind of wood filler or putty. Any help would be greatly appreciated. Thanks. You will need a hardwood dowel and a redrill . That hole looks fresh was there a knot of wood that popped out or something even more sinister . "The fact is, squire, the moment a man takes to a pipe, he becomes a philosopher. It's the poor man's friend; it calms the mind, soothes the temper, and makes a man patient under difficulties. It has made more good men, good husbands, kind masters, indulgent fathers, than any other blessed thing on this universal earth." This was only my third new pipe and I bought it sight unseen through p&c I believe. I thought maybe nording had a reason for leaving the pipe this way but I've found that it's extremely annoying. I find myself avoiding the pipe altogether. You can repair it with a piece of hardwood dowel or similiar. If it were my pipe, I would actually use a bit of JB Weld. It will make it very strong, won't wear, and will be a permanant fix. Before the weld sets, you have the opportunity to insert the stem and make the repair exact. Then remove the stem and allow the JB Weld to dry. I don't think that's a flaw in the briar, I'm pretty sure you're correct and the pipe was drilled this way. That is a terrible quality control slip up from Eric and P&c both. If this is how you received the pipe, I would be asking for refund/replacement. I know what I need, smoke, I can't recall the last time I tasted it....Gandalf in the mines of Moria. "we shall have to share pipes, as good friends must at a pinch'....'I keep a treasure or two near my skin, as precious as rings to me. 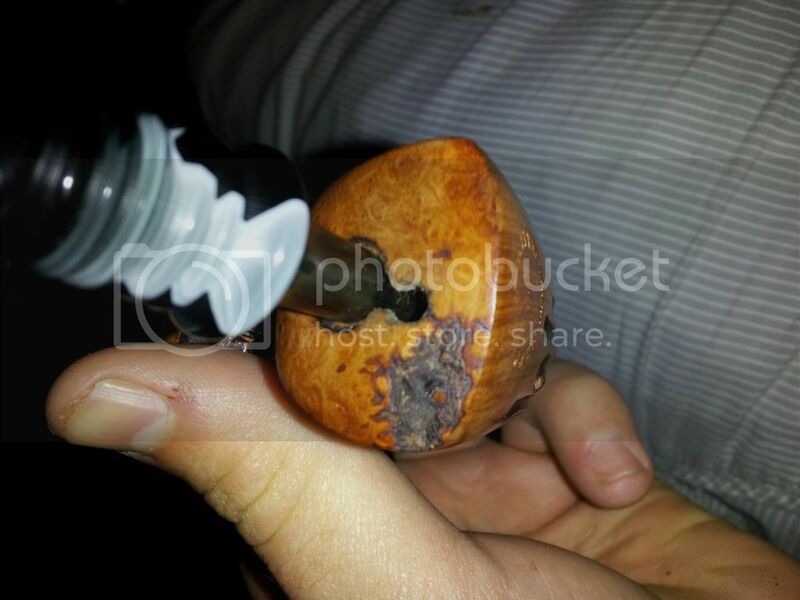 Here's one: my old wooden pipe. And here's another an unused one...He held up a small pipe with a wide flattened bowl, and handed it to Gimli. 'Does that settle the score between us', said Merry. 'Most noble hobbit, it leaves me deep in your debt." necessary) and ask for a replacement. If you indeed bought it new from P&C recently and it came that way, I would definitely call them back and explain the situation. If you still have the box and wrapping check in there to see if a little piece fell out during shipping. I can't believe Eric would slip up that much to let a pipe with a flaw like this pass their QA and have it ship out like that. No way P&C shipped that pipe out like that. Did you try to fix the draught hole yourself mate? On your original post, I assumed that happened when you tried to modify the draught hole. No, sorry I should have specified. I haven't done anything to the pipe yet. It came brand new from p&c that way. Call them... they should be able to assist. Their customer service is excellent. I purchased a Nording natural freehand this afternoon from my local B&M, and there is a slight indention from the drill underneath the tenon, but not as bad as this one. It still still seals fine but makes you wonder how many more may have passed final inspection and made it to vendors.. I went ahead with the JB weld idea. Seems to have solved my problem, I'll have to give it a smoke to make sure. I've owned the pipe for about 3 months and have smoked several bowls out of it before I got fed up with this little issue. I felt like it was my responsibility now for not returning the pipe immediately. Kind of like eating half of a steak then demanding a refund because it wasn't cooked right. I'm happy with it as long as it holds. Guess I've learned my lesson for the next time around. Thanks for all the suggestions.